The fundamental “variables” or distinctions in dialectic phenomenology are: (1) the subjective field of immediate presence (e, determined as +e), (2) the objectifying events of mediation, negation and determination (‑e), and (3) the self‑mediated and self determining co‑relative mutuality of field‑event resonance and feedback (+‑e which leads to e'), However, all three are inseparable distinctions, and by dialectical necessity any one of the variables must exhibit all three within it as part of its intrinsic nature. On the other hand, one can and does linearize these distinctions into three different modalities of presence. Hegel’s Encyclopedia represents such a linearization of a dialectic phenomenology (i.e., Phenomenology of Mind), and we shall in effect be developing a unified field theory of the sciences (i.e., an encyclic‑totality or encyclo‑pedia) as a modern version of Hegel’s initial attempt. Thus, Hegel’s division of the sciences into logic, nature, and spirit reflects, respectively, the division of subject-objectivity into (1) the subjective field of presence as a nonlinear essence or frame of reference (a logic) relative to which (2) existential events in objective space and time appear (nature) such that both together express (3) a logical‑nature or a natural‑logic in the form of spirit, i.e., reality or totality as that which explicitly functions simultaneously as a subjective field and as an objective event‑complex, namely the appearance of nature, self‑reflected or “spiritualized” as the emergence of humanity. Reality as humanity is thus concrete subjectivity or self‑reflecting objectivity. However, from our perspective, Hegel’s initial attempt was phrased and developed within an idealistic gestalt, the development of the initial stage called logic or the subjective field taking place as a thought‑process inde­pendent of its co‑determinate opposite called nature: subjectivity is not immediately grasped as inter‑objectivity and inter‑action. Thus, when nature, or the stages of specific objectification, appears in opposition to logic, it appears only as self‑estranged thought — or thought in its pure “otherness,” which returns to itself as spirit without really integrating both logic and nature into an explicit totality in which neither has any reality without the other. As a result, the dialectic dialogical interrelatedness among logic, nature, and spirit is lost from view and each section appears as a complete totality independent of the other, even though the intention expressed is one that attempts to go beyond such a simple linearization. 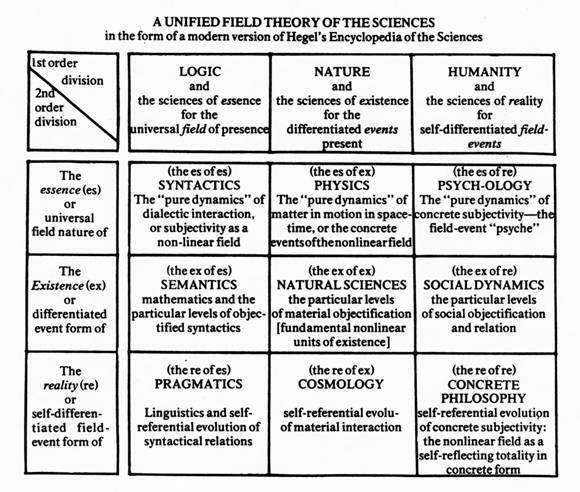 For a concrete unified field theory of the sciences (based upon the self‑development of the nonlinear field of objective inter‑action called subjectivity, through an e, e', e"... e‑ing process or dialectic), and therefore a genuine dialectic of logic, dialectic of nature, and dialectic of spirit or humanity, it is essential to develop the “content” of each domain as an explicit expression of its relation to the whole triad or totality. In this way, logic, nature and humanity, or the sciences of “essence,” “existence” and “reality” are but three distinct perspectives of an inseparable whole, each perspective expressing the whole relative to its particular nature making whole and part co‑relative. Consequently, logic as the science of essence must display (1) the essence of essence (essence qua essence), (2) the existence of essence, and (3) the reality of essence, while nature revealed through the sciences of existence must reveal (1) the essence of existence, (2) the existence of existence (existence qua existence), and (3) the reality of existence. Finally, humanity revealed through the sciences of reality must involve (1) the essence of reality, (2) the existence of reality, and (3) the reality of reality (reality qua reality). Since the “being” of phenomenology is not “ontic” or identifiable but rather dynamic and in transition, there are naturally levels or gradations of essence, existence and reality. Reality, being the integrated totality of essence and existence or subjectivity and objectivity would be expressed in greater degrees by those inter‑action patterns which explicitly display the greatest unity and inseparability (sub­jectivity) of the greatest diversity and distinctness (objectivity) present. And to date, humanity (what Hegel calls spirit) is taken to be the most integrated totality of subject‑objectivity known — and thus the bearer of what is most real, despite its modalities of alienation — in which subjectivity and objectivity, or its essence and its existence, appear in self‑opposition instead of self‑integration. If we look at our dialectical analysis of the sciences of essence, existence and reality, we see not only a major triad (of logic, nature and humanity) generated by the dialectic between the subjective of immediate field of presence and its objectifiable events (a formalization of our “first principle” called the “principle of concrete presence”), but also a triad within each of the elements of that major triad, producing nine elements in relation (and generated by our “second principle,” that of “dialectic necessity”). What this leads to is a non‑ending, self‑generating dialectical phenomenology of triads within triads or cycles within cycles called the “dialectical matrix” (i.e., the e, e', e"… e‑ing process producing a power series of terms: 1, 3, 9, 27, 81 ... based on a continual recycling of triads and hence more complex modes of dialectic necessity). This shows that an indefinite number of levels or cycles of relations can exist, and consequently that “essence,” “existence” and “reality” are in no way regarded as separable “domains” of being. They are rather elements of a dynamic phenomenology of science, to which we shall now turn. For our analysis here a nine term linearization will be investigated as the simplest example of triadic or dialectic necessity in a unified field theory of the sciences, laying the foundations for more complex transformations to take place (see diagram). This represents the encyclopedia as a field theory of nine sciences which shall be explicated in the remaining pages of this article, paying particular attention to the dialectics of nature appearing within the encyclopedia. Consequently, the “common essence” of man-nature interaction, relative to the subjective pole or the “essence of essence” (essence qua essence of subjectivity) is a “pure logic” or syntactic relation, while relative to the objective “pole,” or the “essence of existence” (essence qua existence or objectivity), it appears as a spacetime dynamics or “pure physics.” Actually, both function together, such that the “essence of reality” (or essence qua reality of subject‑objectivity, i.e., the “common essence” seen relative to the mutuality of man in nature) is the non‑localized or immediate state of concrete‑subjectivity or the immediate state of the consciousness process itself. The “essence of reality” is the emergence of an increasingly more integrated and integrating (i.e., total and real) subject‑objectivity in whatever form it might take (which is not to make its actual appearance in any particular form — such as humanity as a concrete subjectivity — a “necessary” and “derivable” fact). The “essence of reality” is therefore a combined “pure logic” of relations and an objective space‑time dynamics functioning as an integral unity. This integral unity is what is often referred to as the “pure psyche” of a concrete subjectivity, i.e., the so‑called anima or soul of consciousness which, qua essence, is a state of being whose specific existence and realizations have yet to “unfold.” The “psyche” is thus both a sign creating activity, or logic, and the objective structure involved with and referred to by the sign creating activity. At this stage, the “pure psyche” is not an individual “id” or developed ego, but rather the body‑environment complex of objective interaction seen as a ground‑condi­tion for the emergence of its subjectivity as an explicit ego consciousness — an emergence which will have to take explicit intersubjective form, but whose intersubjective nature in order to become a “social” being is nevertheless objectively present as an existential potentiality. We have, therefore, developed briefly the first of three stages for the science of logic (as the essence of essence of the science of pure logic and syntactic), the science of nature (as the essence of existence, or the science of space‑time physics), and the science of humanity (as the essence of reality or the science of the “psyche” or “psych-ology” taken in its broadest sense). We can now briefly turn to the second of the three stages which must appear throughout the entire triad of logic, nature and humanity (and which, by dialectic necessity, is also mirrored within the first three stages relative to its modality, but only explicitly revealable in a higher order 27 term analysis). Returning to the immediate state of interaction between man and nature, and the common essence of patterns and rhythms, we find that the function of such a common essence is not to appear as an abstract or isolated “given,” but rather as a frame of reference or field, relative to which particular distinctions and events appear, productive of new patterns and rhythms, such that their mutuality makes both the immediate essence of a “viewing-pattern” or “governing-gestalt,” and the mediated existence of newly arising patterns and rhythms into moments of a larger gestalt. Thus, essence continually becomes redefined through existence, reality being their mutuality as a process but never as a product. Thus, in the state of interaction between man and nature, the various particular events, complex of events (or “objects”) and complex of complex‑of‑events serve to give specification and determination to the universalizing perspective of common essence. Seen relative to the subjective “pole,” such events and objects give expression to the existence of a “semantics” of syntactical relations. A semantical relation is a relation of objectification or localiza­tion. Any element within a structural pattern or rhythm, upon being identified, can become an object of signification. Consequently, within the science of logic, the “existence of essence” or the objectified modality of a syntactic totality introduces semantical activity, the most developed and systematically formulated modality being the science of mathematics. Mathematics is not a “pure syntactic” in that a definite and determinate quantification of syntactic quality occurs. Algebra deals with linearizable and hence arithmetizable elements within sets; geometry, or topology, deals with another kind of presence called spaces; analytics, or calculus, deals with the “limit‑relations” between elements or points in a space (the “mir­roring” of the space within each point or element); “synthetics,” or probability theory, deals with the “measure” each element or point has throughout an entire space (the “mirroring” of each element throughout its space as a total‑space function). Indeed, topology is to algebra as nonlinear fields — or subjectivity — are to linearizable events or objectivity, such that analysis represents the fields or spaces mapped into each of the events, while synthetics represents each of the events mapped out onto the fields or spaces, thus mirroring the entire phenomenology of subject‑objectivity within the mathematical modality of logic or the science of “essence.” Mathematics is, however, not based upon a fixed essence structure, but is rather a semantics of objectification emerging out of a dynamic syntactic, that is, out of a dialectical logic of relations, reflective relative to the subjective pole, of the objective state of interacting patterns and rhythms perceptually present at any stage in space‑time existence. Thus, the concept of number is not a given object but is defined through the type of recognizable operations encountered. Take, for example, addition or powering: the notion of number itself has evolved and continues to evolve through natural numbers, rationals, irrationals, reals, complex, hyper­complex matrices, vectors, tensors, etc. If we now view the state of objectifiable interaction between man and nature relative to the objective “pole,” (existence qua existence) then the various particular determinations continually appearing as specific localiza­tions or as specified events and complexes of events, give expression to the existence of a “determinate physics.” Physics now appears pluralized and quantified into the various particular objective sciences such as electrody­namics, chemistry, biology, and even the social sciences in so far as they can be viewed as objective space‑time complexes. Thus, the science of cybernet­ics — dealing with feedback theory — covers not only the so‑called natural sciences, but is also applicable to bio‑psychological systems and economic-­social‑political structures, when viewed in terms of interactive systems theory. Finally, one can study the existential and deterministic state of man‑nature interaction relative to the total field of subject‑objectivity; that is, relative to the “existence of reality” (or existence qua reality). If the “essence of reality” is the “psyche” as the undeveloped and immediate state of consciousness itself, then the, determinate “existence of reality” is mediated‑consciousness, or consciousness as an explicit intersubjectivity of inter‑psychic reality. We thus pass from “pure psychology” to “social dynamics,” i.e., to the dynamics of groups and class structure, since consciousness develops its potentialities only within the context of an explicit and determinate social process. Thus, the three second moments within the overall sciences of logic, nature and humanity give rise, respectively, to the three determinate or existential modalities called (1) se­mantics (or mathematics as its most systematized modality) which functions as the “existence of essence,” (2) the particular objective sciences as “the existence of existence” (or existence qua existence), and (3) social dynamics as “the existence of reality.” Looking at the encyclopedia as a whole so far, one can state that the “mathematical sciences” deal with levels of structure, the individual “physical sciences” deal with levels of material interaction, and the “social sciences” deal with levels of human relation covering the mediated and determinate modalities of a unified field theory of the sciences. The immediate and non‑determinate (universal) modalities are respectively, “pure logic” or syntactics, “pure physics” or space‑time dynamics, and “pure psychology” as a study of the syntactic‑dynamic nature of immediate consciousness. We can now turn to the man‑nature state of interaction, and study the totality, or reality, of this interaction. This totality, relative to the subjective “pole,” would involve a study of the functional unity of syntactics and semantics — namely, “pragmatics” or “linguistics” as the “reality of essence.” In syntactical relations, forms of patterns and rhythm forms appear as a universal (non‑localized) presentation or dialectic of relations (capable of formalization into theories of syntactics) without any specifica­tion as to objects of identification. In semantics the objects of specification appear as localized linearizations within the overall syntactical field (as “poles within a field”). However, the mutuality between any qualitative syntactical field, giving expression to the forms of relation, and the quantified objects specified by that form (the semantics of the field), is nothing but the activity of a concrete language seen as a continual evolution of qualitative form and relation through the localization of this form in particular objects or “terms.” In concrete language, syntactical relations explicitly express a dynamic of evolution. As a result, objects, terms, symbols, words or gestures no longer remain a fixed semantics in which each object or term has a definite designation (or “truth” value), instead they interact with each other to give expression to a concrete semantics that exhibits syntactical significance. Thus, a meaning‑structure, pragmatics, and organizational pattern continually redefines the terms, elements or objects that appear and have appeared from diverse event‑sources, so that they manifest a functional “organicity.’’ Naturally, as the “elements” trans­form relative to the meaning‑structure, the meaning‑structure is likewise continually redefined through the elements. As a whole, the science of logic displays three subdivisions in which the following dynamic appears. “Syntactical” relations “as such” are prior to any semantical designation of being “true” or “false,” They express patterns or rhythms of relation. Then, “semantical” relations localize the overall patterns and rhythms into determinate terms, any combination of which can be given a definite “truth value.” Finally, in pragmatics or linguistics, we move beyond the designations of what is true or not. Every determinate object, or form, is itself in a state of continual transition, redefinition and reformulation with its co‑determinate forms. As a result, a dynamic syntactic‑semantic language is the reality of any relational structure of subjectivity, and is pragmatically (contextually) determined by the specific conditions of subjectivity present, and not by any fixed rule that is singled out, subordinating a meaning‑structure to a predetermined semantics or rigid syntactics. If we now view the objective “pole” of the state of interaction between man and nature, we can see that a functional unity must likewise exist between pure physics as a nonlinear space‑time dynamics, and its linearisa­tions into determinate event‑complexes. Thus, within nature, not only must there be the physical space‑time field as a universal presence, and particular levels of space‑time interaction (such as electronic‑chemical‑bio­logical and social manifestations), but these levels in turn must reflect the totality of the nonlinear field as a singular process of space‑time evolution. Thus, we pass to cosmology as the “reality of existence,” or as the study of all of nature, now seen as an emerging totality, and as a space‑time structure determining its modalities through its appearance in particular forms. From this perspective, the various localizations of nature into specified event‑complexes, patterns, and rhythms (such as electrons, atoms and cells), must be re‑grasped as a singular cybernetic feedback structure, expressive now of a concrete physics of evolving and transforming objects, whose subjective counterpart is the evolution of language as a dynamics of evolving and transforming signs of signification. We can now pass into a consideration of the totality of interaction between man and nature, relative to that totality; that is, to the reality of reality or reality qua reality. In the science of humanity, its essence was seen to be the immediate field of consciousness as a “pure psyche” of body-­environment interaction. The “soul” or anima is literally the dynamics or animation of one’s body‑context system, or the body‑environment complex experienced as a singular and immediate state of subjectivity or awareness. Now its existential form is none other than its appearance as a social‑dynamics of “ego-ego” interaction and class structure. Thus, the various “social sciences” appear in this domain, not as a natural space‑time complex of social behaviorism, but rather as a state of social‑experience — a state of interpersonal “seeing and being seen” — involving us with the dynamics of both authentic process consciousness and alienated product consciousness, and consequently with the dynamics of revolutionary praxis. Social dynamics views immediate consciousness as a mediated‑social structure of interacting levels of awareness as the essence, or condition, for the very presence of consciousness, and its existence through mediated particular forms of intersubjective societies, in turn are but two moments of a self‑mediated totality. In self‑mediated awareness, concrete subjectivity experiences itself both as a universal field of “everpresent” immediate awareness, and as a mediated presence which transforms itself socially and historically into changing levels or perspectives of awareness. It is this very transformation of consciousness through history and revolutionary praxis (through its authentic expression as a process and never as a product, isolated goal or end) that expresses the reality and being of consciousness as a dynamic immediacy. Self‑mediated consciousness is the state of true en­lightenment; the state in which the opposition of immediate being (being as such) and mediated becoming (becoming or revealing something other) appear united into a singular state of self‑becoming, self‑determination and freedom. Self‑mediated awareness is the subject matter of the sciences of “concrete philosophy”; not philosophy idealized into a given set of rules, norms, or patterns (academic philosophy), but rather philosophy experienced as the “love of wisdom,” as a total praxis of integrated human­ism and naturalism whose being is precisely that which is ever in a dynamic state of being‑given or being‑made. To experience your identity as lying in the very “transcendence of identity,” to experience the philosophical trinity of the “beautiful, good, and true” as the becoming of truth and never as the possession of truth, is to become free of the alienated states of mediated consciousness that merely defines itself through its own products. The positive nature of religion, insofar as it is directed towards the notion of transformation and transcendence rather than passive submission and the denial of the objective interactive nature of subjectivity, is an integral aspect of concrete philosophy. Thus, “the essence of reality” as psychology, the “existence of reality” as social dynamics, and the “reality of reality” as concrete philosophy reflect the state of man-nature interaction relative to the phenomenological totality. At the same time, linguistics, or natural language as the “reality of essence,” and cosmology as the “reality of existence” can likewise be seen as culminating in concrete philosophy as the “reality of reality.” The evolution of concrete language as the subjective “pole” of reality, and the evolution of the cosmos as reflective of the objective “pole” in its dynamic state, together define concrete philosophy as a subjective-objective totality in which the evolution of language (the evolution of the dialogical state of intersubjectivity) is but the very form of the evolution of cosmic objectivity, which in turn is but the content of interaction for intersubjectivity. When what one “speaks” is at one with what there “is”; when language is not used to hide existence and the sensual world of objective existence; and when objective existence in turn gives birth to its own form of communica­tion; then one has transcended both empty verbalism and blind facticity. Philosophy as concrete wisdom is the living unity of Logos and Cosmos, and this living unity is life lived as a permanent revolution in which all being is being, and all formation at once trans‑formation. Finally, one can look at the entire nine sciences and examine the “diagonal” triad which cuts through the triad of essence, existence and reality along both triadic directions at the same time (through the major triad and the sub‑triad within each member of the major triad). Pure logic, or syntactic, is essence qua essence; the particular physical sciences represent existence qua existence; and concrete philosophy is reality qua reality. The unified field theory of the sciences regards the “aesthetics” of dialectic as a dynamic syntactic of transitional relations to constitute “pure subjectivity” which, however, is nothing but the mutual co‑determinate of “pure objectivity,” i.e., the existence of a diversity of event‑complexes and complexes of event‑complexes in space and time. Pure subjectivity as the “universal,” and pure objectivity as the “concrete” aspects of phenomenology, give us pure subject‑objectivity, or “concrete universality” (the concrete universal), as their reality, or “reality qua reality.” Thus, concrete philosophy now appears as the dialectical unity of pure essence as “logic” and pure existence as “facticity.” Pure (a priori) syntactic and wordly (a posteriori) objects. This would be a contradiction in terms were it not for the fact that all logic is a natural logic, and all nature, a logic of interaction, alienated consciousness reducing the necessary distinction between them into a suspended separation. The point of this encyclopedia has been to dissolve the separations such that the distinctions can become heightened to express each science as a universal “monad” and a unique modality of all states of the universe, instead of as a simplistic expression of a narrow field, whose boundary states are at best ambiguous, but most generally productive of contradictions and distortions. Having given a brief outline of a modern version of Hegel’s encyclopedia of the sciences as the basis for a unified field theory of the sciences, we can now center our attention on the existential‑objective aspect of that outline: the dialectics of nature. As already indicated, the dialectics of nature, as an integral aspect of an explicated phenomenology of subject‑objectivity, must appear as an “inner triad” of pure physics, the various physical sciences in particular, and cosmology. In pure physics, one is concerned with formulating an “objective syntactic” that serves as a concrete “model” for the explication of the various specific event‑complexes that appear in nature. Thus, physics as opposed to the various natural sciences, is not limited to a specific event‑complex (molecules, stars, cells, etc.) but rather studies the “general laws of matter in motion common to all levels of existence.” Any one state of awareness reveals both a particular event­complex as an expression of the whole of objective existence with which it exists in co‑relation as previously indicated. One never merely observes a concrete object or a universal and general condition, but always a concrete universal. The point is to grasp in greater and greater detail the many ways in which each experience is a congressence of universality. In physics, general laws of dynamics have emerged, expressed in such forms as conservation principles and symmetry conditions. These terms characterize our present state of awareness of the physical universe of space and time. Central notions of momentum, impulse and force, energy, work and power, have gradually evolved into a complex pattern of “objective syntactic” which serves as the basis for the “physical models” of particular event‑complexes. Now, the nature of all such objective syntactical relations is that the particular event‑complex in which they initially appear is no longer referred to as a limiting condition of the syntactical relations discovered. Newton’s law of force as the “rate of change of momentum,” was initially regarded as a simple empirical generalization of a particular level of chemical‑mechan­ical interaction. In this case, Newton’s law would he a particular law of a particular level. Just as the “ideal gas law,” Newton’s law would involve an “empirical experimental constant”; a “coefficient” that relates one set of observed variables to another set of observed variables; a constant that has to be determined (and continually redetermined) through particular experi­ments. However, if one is interested in the syntactical relations which connect the terms to each other, then Newton’s force law has to be “idealized,” which is to say that one variable or set of variables is now defined in terms of the others as part of a necessary relation — once one agrees to the usefulness of the “abduction” which permits one to idealize a particular experience directly into a universal and ideal form. This naturally explicates a condition of coherence of variables, and can only be “justified” if one remembers that in a nonlinear field, all variables are inseparable distinctions and mutually co‑determinate; the point being in finding out the relative scope and depth that can be given to the co‑relation and co‑appear­ance of any two particular distinctions. In Newton’s case, force as a contact­-relation between two systems or “masses” and the “rate of change of momentum” of the masses were defined as mutually inseparable and “necessary.” Any contact always produces a change in state of motion and vice versa. Thus, force is not simply measured as proportional to the rate of change of momentum; but as an ideal principle, defined to be always co­present with a rate of change of momentum and numerically equal to it (the proportionality constant between them being defined and not measured as unity); although the notion of force as a contact relation is still distinct from the notion of changing momentum. Force and change of momentum become extensionally equivalent. This means that Newton’s law now expresses an ideal principle of rhythm and pattern which is neither true nor false “semantically” (neither verifiable nor disprovable in any particular experiment), but only syntactically relevant or not relevant as a general perspective of analysis. By making force into a definition, this means that a momentum change must involve a contact relation (even if as yet unobserved) and, vice versa, no one exper­iment or set of experiments is ever capable of uncovering all possible “contacts” or “momentum changes” in order to “ultimately” prove or disprove this idealization. At the same time, however, an empirical idealization forces scientists to continually reexamine empirical evidence in order to reveal hidden possibilities. Thus, for example, an object moving due to a single visible force, through space, not producing a change of momentum must, according to Newton, reveal, upon further examination, hidden “friction” forces in space balancing the visible force so as to not produce any net change of motion. The success of Newton’s laws on the gross chemical level (in particular, celestial mechanics and present day space dynamics) lies precisely in its ability to always co‑relate any force contact with a change in momentum, and vice versa. Empirical idealizations are therefore programs and projects for research, directing one’s attention to nature with the intent of making explicit, implicit patterns of possible relation. All general laws of matter in motion such as Newton’s laws or the conservation principles of momentum and energy are such “pragmatic a priori” formulations, i.e., formulations which are neither logically derivable by deduction from pure syntactics, nor empirically derivable by induction from a specific complex of determinate events. They are rather empirical idealizations obtained by abduction, paving the way for future experimenta­tion. Thus, the way in which they are used, and the particular meanings attached to the various distinctions contained within any ideal law (mass, space, and time, etc.) continually change. For example, in modern times, Newton’s laws would not be very relevant if one could not define the existence of field momentum (field momentum not known to exist in Newton’s time), the absence of which would imply the necessity of assuming the existence of unknown relations in order to keep Newton’s law in operation. What happens, therefore, is that an evolving syntactical structure of objective interaction appears, and through continual redefini­tion and reformulation, the scope and depth of the individual syntactical principles involved become increased. By not delimiting the syntactical content of co‑relation to particular semantical forms, (e.g., the structure of atomic relations to only atoms) one not only achieves a more universal appreciation of the non‑localized nonlinearity involved in the dialectic of syntactical relation, but at the same time comes to appreciate the concreteness of the particular semantical forms involved. Each semantical form of particularity makes a general syntactical relation take on a certain empirically limited nature. Although no one semantical form exhausts any general syntactical relation, no general syntactical relation manifests itself except through particular forms which are bound to delimit its universality. We now come to the modern theories of relativity and quantum mechanics. From the perspective of “pure physics” (and also that of the particular sciences of nature) both of these theories are still not in proper form. Thus, like the ideal gas law, both formulations rest on empirical constants. However, unlike the ideal gas law, both constants are taken to be universal qua measured (and continually re-measured) value — which is of course a contradiction in terms (even if the constants have a greater applicability and a more universal scope than that of the ideal gas law’s constant). Any measured and re‑measurable quantity is, by definition, limited to the time and context of the act of measurement and need not be universal in all of space or for all of time. An empirical value limited to a specific context must reflect the spatial and temporal localization of that context qua measure, even if the syntactical relations involved go beyond the context. Relativity is based upon the constant velocity of electromagnet­ic light, c. Quantum mechanics is based upon the quantum interaction, h, which is also electromagnetic in nature in that it relates electromagnetically conditioned energy and momentum (energy and momentum as a function of the speed of light, c) to its frequency and wavelength when considered in its most general form. Thus, relativity and quantum mechanics must properly be studied as part of a particular science (the science of the “electronic-level” of interaction), and must not be regarded in its present form as a generalized syntactic on the same level as the generalized equations of conservation of energy and momentum or the generalized force equations. If this is not done, then relativity and quantum mechanics in its present form can distort measured event‑complexes into an electromagnetically conditioned gestalt, when in fact it might be due to a non‑electromagnetic process. Indeed, present day “neutrino physics” and the study of “weak forces” in general, may eventually give a clue to the existence of sub‑electronic interaction, and consequently to the possible existence of interactions not bound by the empirical constants c and h. For clarity, there should be a sharp distinction (but not separation) between the generalized “viewing patterns” which are not empirically limited, but ideal syntactical relations, and the “viewed patterns” which must come through empirical values and constants and always refer to specific manifestations and event-complexes, so that their interrelation as a dialectic of universality and concreteness can be given explicit form. The dialectic of inseparable dis­tinctions only functions as an inseparability and unity, to the degree to which the distinctions are clearly in view; otherwise a vague indistinct inseparability emerges and contradictions appear. This is exactly what is happening today in relativity and quantum mechanics. The generality, or universality, of perspective is confused with the particular level through which this universality (nonlinearity) of syntactical relatedness appears. As a result, the genuine universality of relativity and quantum mechanics, offering insight that goes beyond the values of c and h, (having applicability in many domains, such as psychology) is confused with the dependency that is put on these limited values of velocity and interaction. Conversely, the particular level to which the concrete values of c and h belong, namely the electronic level, is regarded primarily in an abstract syntactical fashion void of specificity. One is often told that electric and magnetic fields do not “really exist” as material states, and that relativistic “changes” in electro­magnetic variables are not physical but due to a non‑material change in space‑time relations nevertheless having physical consequences for the electromagnetic variables. At the conclusion of this essay we shall present a theory in which relativ­ity and quantum mechanics in their specific form are derived from the electronic level by showing what this implies for a dialectics of nature and for the present state of physics. However, one can also regard relativity and quantum mechanics in terms of their universal syntactical natures independent of the empirical values c and h (just as Newton’s laws can be generalized to mean a coupling between any kind or degree of contact or interaction, and a change in any kind of “steady‑state” motion. When this is done, an interesting aspect of the nonlinear dialectic is revealed. Thus relativity does not consider the existence of an absolute space‑time whole, but only the space‑time whole relative to and a function of each particular element or particle. Conversely, quantum mechanics does not consider the existence of absolutely determinate elements or particles “in themselves,” but rather regards each particle relative to and a function of the entire space‑time whole it functions within (as a “wave‑function”). This means that whole and part, the universal and the unique are dialectically co‑determined by expressing in physical terms the nonlinear field of interaction from two complementary perspectives in which the (1) insep­arable space‑time whole is mapped into each distinct part, or “frame of reference,” and never exists as such, as a single absolute (the condition of relativity) and (2) each distinct part is mapped out into the inseparable whole and is never a simple delimited or bounded particle (the condition of quantum wave mechanics). However, such a complementary syntactic between relativity and quantum mechanics is usually lost sight of precisely because of the semantical localizations (c and h) which bind them in different ways to the behavior of the electromagnetic photon. Relativity expresses the determinate analytic whole‑oriented aspect of the nonlinear relation, while quantum mechanics expresses the indeterminate synthetic and part‑oriented aspect of this nonlinear relation. Thus, a nonlinear field is at once deterministic (each part mediated by the whole) and indeterministic (each part itself an immediate whole). It is a self‑determinis­tic (self‑mediated) totality of part‑whole mutuality which is neither strictly causal or a‑causal, but exhibits both within a condition of mutual causality, expressive of a reciprocal feedback, co‑determination and self‑interaction of all elements. Looking at the first domain of the dialectics of nature, called “pure physics,” as a totality, gives us the following syntactical structure. The overall space‑time dynamics reveals a whole‑part dialectic of events, event‑complexes (objects), and complexes of objects in which one must distinguish between levels of material interaction. On any one level, the conservation of momentum expresses the constancy of visible movement. However, for that one level, the kinetic energy may or may not be conserved. If it is, the “collisions” or interactions are called “elastic” — which means that the internal non‑visible motions within the interacting objects are ignorable or non‑existent. However, if the kinetic energy of motion is not conserved for that level, then deeper levels of internal movement must exist if the overall state of energy is to be considered a constant. This means that internal energy exists either in the modality of unorganized and “random” motion or in that of “organized” potential energy (a form of organized motion). An interaction between objects or bodies is then not only an action taking place on the visible or given level, but one also taking place within the objects or participating systems and hence on a deeper level. From what we now know of object interaction, one can state that in general, all interaction is always between and within any two or more objects or event‑complexes that are in mutual relation. Thus, there is no such thing as mere “external contact,” and no particular “particle” of movement can itself be localized as a “simple point or event.” Here we have a physical counterpart to what was called the second principle of dialectic necessity. In fact, the fundamental syntactical structure in modern physics is not a particular particle or event­-object‑complex, but rather field phenomena, within which particulariza­tions and localizations (“poles”) of energy appear as particles. Thus, the general field of interaction in physics is nonlinear — nonlinearity in physical interaction being expressed through the self‑coupling or resonance that exists between the universal (inseparable) field and its particularizations (distinctions). A pure field “as such,” as well as pure particle mechanics “as such” is essentially linear even though it can express non‑linearities. It is precisely their dialectic of co‑relation, in which particles are self‑localiza­tions, or products, within and of a field or process of interaction, that gives the paticular quality of nonlinearity to the field. In such a state, the “whole” is never the mere “sum” of the particles, but includes their intrin­sic mode of interaction — no particle existing as an abstract isolated quantity to begin with. Here then, we have a physical counterpart to our first principle of concrete presence, in which all objectification is considered to be the product of the subjective field of presence itself not localized. Particularization and localization within an interacting field of space‑time events (gravitational, electromagnetic, strong and weak fields) represent linearizations and polarizations of a nonlinear field of inseparable distinctions (the mediation of an immediate field of presence). These localizations in turn can either disintegrate and return to the field, or become re‑organized among themselves to form a higher level of nonlinear field interaction (a higher order self‑mediated immediacy). Thus, we have here within the first domain of “pure physics” the fundamental transition to the second domain: physics now considered in its determinate modality of appearing as level‑complexes of particular forms of matter in motion. The second domain of physics, or nature, is to consider the various particular event‑complexes that constitute existence qua existence. However, we have seen that the syntactical structure of relations ever‑present in various forms as the ground or “essence” of these existential structures is the nonlinear field of interaction. Furthermore, the dialectics of such a nonlinear field itself can express a cycling from an immediate field or level of presence (e), through mediations in the form of localizations and polarities (+e, ‑e), to a self‑mediated nonlinear field of a higher order level of immediacy (+‑e or or e'), one which functions on a qualitatively different plane of interaction, constituted now out of the previous linearizations, localizations or polarizations, reorganized into a new modality of nonlinear­ity in which the previous linearizations or localizations have now become a relatively stable substructure no longer disappearing into the simple non­linear field from which they emerged. We shall therefore start our central core of the dialectics of nature, existence qua existence, by a presentation of the entire known universe of space and time in the form of a leveling struc­ture of nonlinear fields. We shall start with the lowest level of immediacy that is presently known to us: the electronic level. Here, the nonlinear field is the photon‑field of electromagnetic energy traveling at the speed of light, c. The linearizations or polarizations arising out of this field are charged particles whose only stable forms are positive and negative charges. In fact, the only stable particles of finite rest mass are electrons and protons. The electronic level is characterized by a charge‑charge interaction system, in which the field of energy causing the charge process to manifest itself is the photon field. Indeed, not only is each charge in a state of continual (“virtual”) photon emission and absorption, and not only does the acceleration of charges liberate “real” photons, but the charges themselves are nothing but “photon-complexes” in the sense that they can be completely annihilated into electromagnetic photon energy. These charges, in their state of interaction, can reorganize themselves into a trans‑charged state: into atoms and groups of atoms, in which a qualitatively new form of objective nonlinear interaction manifests itself. Thus, the chemical level appears when whole complexes of atoms — in the form of galaxies of stars and planets — begin to manifest themselves as a new nonlinear field: the field of chemical matter in the form of gases, liquids, solids and plasma. On the chemical level, atoms form a new type of interaction structure, the formation of complex compounds of atoms and molecules of atoms. Here the fundamental quality which characterizes the chemical level is the com­pound‑compound interaction, in which the unit of energy exchange consists of atoms of organized charge (in contradistinction to the electronic level, in which the fundamental quality consists of charge‑charge interaction, the photon being the basic unit of energy exchange). Inorganic and organic compounds are the polarizations and mediations on the chemical level (produced by selective coordination of atoms from a given field of atoms into singularities which differentiate them from their background) whose most complex modalities are protein structures and the DNA‑RNA type organizations. Just because it is easy to “visualize” compounds as “sums of atoms,” the mistake must not be made that it is a linear sum. The “addition or subtraction” of any one atom or charge to a molecular‑complex causes the whole complex to reorganize its structure. Moreover, the chemical level, just like the electronic level before it, is productive of a synthesis of its linearizations and polarizations which in turn acts as the basis for a qualitatively new level of nonlinear interaction. The living cell is the most complex chemical structure, and is at the same time the basis for the development of the biological level of interaction. On the biological plane of activity, a nonlinear cellular field of interaction occurs, in which living matter gradually develops its forms of linearizations; namely, particular organs of cellular activity in which cells are organized into tissues of plant and animal life to perform specific functions. Cellular activity produces complexes of organs and organisms of organs by self­differentiation and reproduction. The fundamental quality which characterizes biological activity is the organ‑organ interrelation, in which the basic unit governing energy transfer is the cell. The biological level, like the chemical and electronic levels before it, develops its particular type of interaction producing more and more intricate forms of organ‑organ inter­action, until the point of complexity is reached where a qualitatively different mode of interrelations begins to appear. The organ‑organ complex of either plants or animals not only expresses a particular type of cellular based energy‑state of interaction within itself (metabolism) but this form of energy‑relation functions through a reproduction of its entire structure. Groups of plants and animals emerge, so‑called societies of organisms, in which the organisms have a different kind of affinity towards themselves than the groups or combinations of molecules on the chemical level that have not appeared as a result of organ self‑reproduction. However, all of these “social” structures are essentially biological in nature in that the so-­called social patterns of behavior are basically instinctually determined and biologically inherited. It is only with the emergence of man out of pre‑man, that the most complex modality and organ synthesis of the biological level at the same time becomes the basis for a genuinely higher level: that of the social level of human interaction. The characteristic feature of humanity as a nonlinear field is that of cultural interaction (by culture, we mean the existence of a definite pattern of social‑inheritance). Thus, unlike so‑called animal societies, man, through the development of tools of production and records of relations, produces cultural groups, families, clans, tribes and classes in which each new generation does not start from the same instinctual pattern biologically given, but rather builds upon the culture already lived as a history. Human culture exhibits a unique form of historical feedback with its own past development, and consequently with projections into the future of goals of development not yet achieved. Consequently, the fundamental quality of the social level consists of class‑class interaction (or group‑group interrelation) in which the fundamental unit of energy production and exchange is the human individual. Individuals are indentified by their cultural‑national inheritance as a social entity and society is a complex “organism” of class and cultural (as well as subcultural) group structures. The individual is the unity or unit of interrelation within and between these class‑group struc­tures, giving them their coherence. The social level of relation is therefore a cultural group‑dynamics in which the individual exists as the active agent of interaction. To the degree to which the individual is therefore merely identified with one group against another, he delimits and alienates his identity into a given pattern of class or group relation and the society in turn becomes class‑fractured. The function of a truly “democratic” society is to permit the individual to express his trans‑group identity as an active agent of interrelation and intersubjectivity by means of well developed feedback activity in its social, economic, political and cultural relations among all groups. This makes the society an integrated and fluid system, and at the same time, frees the individual from being class‑identified or reified: belonging to only such and such a class or group, performing only such and such an activity. This class identification establishes the condition for exploitation, private property and the alienation of an individual from the total social dynamics; a dynamics which is but an outer expression of his inner potentialities to be a total self‑determining agent. Social dynamics is not a question of the individual versus the “state” or “society,” but rather both the individual and society versus the hardening of the group and class structures that simultaneously delimit the individual into a rigid pattern of behavior, and fracture society into an internal “civil” war of classes and groups. A little reflection will show that it is not individuals qua individuals which are anti‑social or anti‑intersubjective (individuals indeed being in need of intersubjectivity in order to develop their own subjectivity); it is rather their class, group, family and clan identification which causes them to view other individuals through the products and results of experience (their traditions, patterns of behavior and norms), instead of through the process of direct and immediate experience which is nonlinear and interactive by its very nature. Thus, out of the nonlinear field of humanity class organization appears as its linearization, and the synthesis of class structure into a functioning unitary society of interrelating groups demands the transcendence of the alienating and separatistic character of class structure. This is not a “utopian” quest, but only a matter of spelling out the functioning dynamics of what an “efficient” society really must be. Material‑physical efficiency and integrity on a total social‑natural scale is actually congruent with physiological‑psychological‑social or “humanistic” integrity. The picture of a brutal “1984” in which technical efficiency must supplant human values is totally misleading and indeed propaganda bred by the myth‑making structures of today’s society. Genuine self‑reproducing and self‑sustaining material efficiency can only function to the degree to which the human agent can express his individuality as being free of any rigid class or group identification which fractures society as a “smoothly running” intersubjectivity. Naturally any transition from a given fractured society to one that is not fractured would necessarily seem violent, aggressive and productive of the release of hostility by virtue of the boundaries of identification that must be “softened.” However, it is necessary to distinguish between the smoke produced as a result of de-localizing already existing suppressed violence (and active violence), and the flame of genuine human need which is ever attempting to give explicit expression to the intersubjective “I and thou” condition of its subjectivity. It is always possible to degenerate, as well as to generate into different modalities of nonlinearity. Stability is the greatest hoax of all time. The only genuine “stability” or “identity” possible on any level is the very process of transformation itself. Looking at the four levels of nonlinear field relations (the electronic, chemical, biological and social levels, together with the various particular sciences that study each of these areas or combinations of these areas), we see that we have traveled from the photon to society, through a process of continual linearization (localization, polarization) and re‑nonlinearization­ — each time producing a qualitatively distinct form of energy‑interaction. In this development, the photon, the atom, the cell and the human being appear as nodal points of transition, and in each case the unit involved or evolved on one level is precisely that which becomes the fundamental unity of energy production and exchange on the next level. Indeed, a functional unit such as a photon, atom, cell or human being, is representative of the universal gestalt or nonlinear field relative to a particular level of existence. It is a functional sub‑whole of the whole it is within. Therefore, should it begin to be subordinated as a part of a larger system of organization (photons or electromagnetic energy within charges, or atoms within compounds, or cells within organs, or individuals within groups or classes), then the integrity of that unit will be delimited until a sufficiently developed structure appears in which the units no longer “belong” to any one meta-­unit organization, but are rather the active energy‑agents between a whole series of possible organizations and hence beyond the limitations of any given organization. Thus, photons as sub‑whole elements appear localized as electromagnetic energy within any one charge. However, as part of a charge‑charge interaction process, they become free agents of exchange, which indeed is what gives the charges their characteristics of “charge-attraction or repulsion.” Similarly, this charge‑charge system, when balanced into an atom or a molecule begins a higher level of unit‑activity in which at first the unit atom or molecule becomes localized within certain compounds or structures, but finally becomes re‑leased as an active energy exchange unit between compounds. Not only is the human social domain itself an integral aspect of a dialectics of nature, but the nonsocial levels of the dialectics of nature­ — the electronic, chemical and biological domains — can also in their own ways manifest the “problems of alienation” or rigidification. Thus, the functional efficiency or integrity of any system can be investigated to see if it appears overly determinate and whole‑oriented, or overly indeterminate and part­-oriented. Those systems which exhibit the greatest degree of explicit inter­relatedness between their elements of distinctions and their field of insep­arability have the greatest potentialities for growth, expansion, and hence self‑expression through transformation — transformation being the essence of any element or event. Naturally, each level develops its own unique expression of the type of transition process in existence. The electronic level gives birth to the fundamental “charge-process” which characterizes the constitution of atoms. The chemical level gives birth to the “metabolistic-reproductive” process characterizing the cell. The biological level brings about brain‑body “consciousness” which characterizes the human being. The social level brings about “cultural praxis” which distinguishes the dynamics of society from previous levels. Whatever is previous or subsequent to the four known levels of interaction can only deepen the many ways in which the dialectic of field‑event subject‑objectivity can manifest itself. It can in no way devaluate that which has already expressed itself and that which is presently the appearing modality of dialectics. Thus, objective reality is not a single and abstract dialectical field unity, or a diversity of plural forms, each of which reflects some particular or limited aspect of a dialectical process. Objective reality is literally the existence and explication of the entire dialectic essence of nonlinear inter­action in object form. Multiple centers or units of dialectical synthesis exist in a space‑time “organic” totality of levels of relation, these units determined here to be the photon, atom, cell, and the human being, as far as we know to date. Consequently, each of these units must be studied as a particular manifestation of a universal process of nonlinearity. Each of these units must be investigated in terms of its organizational nature as the synthesis of polarizations coming from a deeper level of nonlinearity. The atom, cell, human being and even “society” as a functional system (although not as yet a new self‑integrated unit for a still higher order “metahuman” or “metasocial” interaction) all display a “nucleus‑body” type of organization. Thus, there is the positive nucleus and the negative electronic shell structure of the atom; the nucleus and cytoplasmic structure of the cell; the organizational brain and the body of the human being; the governmental “state,” and the individuals of society. All of these display both functional and structural similarities which are here regarded not as superficial similarities but as essential similarities reflective of the existential modality of a dialectics of nature. The unit of a given level of nonlinear field activity is actually itself a self‑mediated unity of the previous nonlinear field. The atom, for example, is a self‑mediated unity for the electro‑magnetic photon field with its continual propensity to appear and disappear as positive‑negative charges (electron‑positron creation and destruction). The atom is a particular kind of positive‑negative synthesis of a proton (neutron) nucleus that is positive, and an electron shell structure which is negative. The nucleus, although constituted by a proton‑neutron interaction field whose energy exchange unit is a meson, is nevertheless still a composite charge structure that can be disintegrated into elements on the electronic level which are light, or c, conditioned. Electrons, protons, photons and neutrinos will appear upon one form of disintegration. These in turn can be transformed completely into electro‑magnetic photons traveling at the speed of light, c, and neutrinos (uncharged, but with “zero rest mass”) which also appear to travel at the speed of light, but whose real function is not understood. It is this electro‑magnetically constituted positive nucleus which gives the atom its basic chemical identity, the negative electronic shell being its mode of contextual relatedness to other atoms within a chemical level. However, even though it is possible for negative protons and positive electrons to exist (and conceivably — thus far — an “anti-atom” made up of a negative nucleus and a positive shell structure), our known universe functions in a definite way in which the positive charge is always nuclear and the negative one always extra‑nuclear. Furthermore, from a dialectical point of view, functional opposites are not merely symmetrical, but also asymmetrical. Even positive numbers and negative numbers in mathematics do not function the same way. Self‑multiplication preserves positivity but cancels negativity. Subjectivity and objectivity, self and world, female and male, center and periphery, for example, are not mirror opposites (abstractly replaceable); they complement each other to form a mutual totality. Thus, the polarity between positive and negative charges is not just a mechanical minor symmetry, but a functional one, in which positivity and negativity on the electronic level are qualitatively different and express a certain kind of organizational activity. Positive charges become nuclear and give unit identity, while negative charges are those which act extra‑nuclear and express unit interrelatedness; because of the functional interrelatedness between them each is complementary to the other but not replaceable with the other. Turning to the cell, we see that the nucleus with its hereditary DNA‑RNA structure, expresses cellular control and gives biological identity, while the cytoplasmic protoplasm serves to interrelate the cell to other cells and the environment. Within the human being, the brain is naturally the functional identity center (whose essential “memory” structure is also RNA constituted), while the body is the means of environmental interaction. Finally, within society, the particular governmental‑state structure expresses the social identity present in terms of a visible and legal power apparatus, while those groups not directly involved in governing represent the body of a governed society, i.e., society itself as a living and functioning organism relating to other such organisms or nature itself in its “natural” or “extralegal” manner. If we return to our description of the dialectic of man in nature, seeing how it is reflective of a dialectic between subjectivity, or field of presence as the observing patterns, and objectivity, or the events present as the observed patterns, and hence objectivity in a state of self‑observation in which subjec­tivity represents the interactive state of objectivity permitting self‑related­ness to appear, then one can easily interpret the significance of the “nucleus body” nature of all units of existence. Thus, the nucleus structure or system expresses the subjective aspect of a unit in its reflective mode and hence manifests “controlling or observing” patterns. The body structure of a system represents the objective aspect of a unit in its immediate modality and hence expresses those “observed or functionally present” patterns of unit environment interaction immediately present with which the nucleus must be functionally coordinated in order to act as a reflecting and controlling pattern. The nucleus “control center” is thus an objectifled (reflected and mediated) subjectivity, whereas the body is a subjectified (immediate) objectivity. In a sense, it is actually the body of immediate interrelatedness between unit and environment that is the objective base and content of a unit, while the nucleus of control, order and reflection is the mediating superstructure emerging out of the objective immediacy of nonlinearity which expresses the form and direction of that content. The body is thus the immediate state of objective energy or Eros and the nucleus the reflected state of subjectivity, or Logos, which together function as a self‑mediated telos of action, if they are not functionally degenerate or uncoordinated. Each higher level of nonlinearity is thus a qualitatively more complex expression of a telos of self‑interaction and field‑event unity, whose appearance as explicit ego consciousness and social interaction is the most advanced form yet encountered in terms of the complexity of field‑event feedback and subject‑object interdependency. If we now look at the totality of all levels known to date, the social level naturally stands out as the most complex and self‑integrated one. This means that the interaction state between man and nature is a social dynamics of man qua culture and nature, embedded, however, within a biological interaction state between man qua animal and nature, which in turn is embedded within a chemical interaction state between man qua chemical and nature, which in turn is embedded within an electro‑magnetic interaction state between man qua electro‑magnetic photons and nature. Furthermore, this means that man is actually, at least, a four‑level natural complex functioning as a singular totality (not “reducing” the higher levels to the lower ones, or “subordinating” the lower ones to the higher ones, but rather seeing them as a singular state of interrelatedness). Indeed, man’s brain is unique in the way in which all four levels are brought together as a single unit of nonlinearity (the nerve process as a socially conditioned electro‑chemical cellular process) and unsurpassed in its depth and scope of subjectivity and intersubjectivity; that is, the depth and scope of the way in which the brain both expresses, reflects and self‑reflects the universal state of nonlinear field interaction. However, if we look at the known levels of particular nonlinearity as a totality, in relation to the universal nature of nonlinearity as described in the first section of “pure physics,” we see that one cannot expect the photon to be the ultimate unit of existence (the “alpha point,” as the atom was once thought to be), nor can we expect society in its present form or its future projection as a unified society to be the most developed unit of existence (its “omega point”). The photon itself may be but the most complex unit of energy‑organization of a sub‑electronic level (involving the neutrino in some way), just as society as an integral unity may be but the beginning of a meta‑social level‑perhaps an “interplanetary” “intergalactic” society within which the human being becomes transformed into a higher order consciousness. This means that the velocity of light need not be the “ultimate” one, but only a constant for a certain level of matter. Larger velocities of energy transfer might be discovered, revealing deeper levels of matter which at the same time could serve as a means of developing higher levels of social interaction. At this point, the dialectics of nature becomes a cosmology of structure and evolution, for we are passing through the transition point to the third and last section of the dialectics of nature. From the viewpoint of the cosmological totality of transformation, all the particular levels of objective interaction cease to be merely determinate structures of existence, and become self‑determinate structures of objective reality as a totality. Thus, we observe that not only has the social level of explicit intersubjective consciousness emerged out of a biological womb, but the biological level in turn appears to have developed out of a deeper chemical womb of inter­galactic structure. It also appears that this chemical complex evolved and might still be evolving out of the electro‑magnetic space‑time field that pervades all of known space and time. Considered as a self‑evolutionary process, objective interaction thus presents us with a dialectics of nature whose reality is the coming into being of consciousness. Indeed, scientists regard galactic structures as filled with trillions of trillions of stars and planetary formation as a very common formation (perhaps one star in every 100 or 1000). Furthermore, among the planets, the proper conditions for life and social development is deemed to be quite frequent (perhaps one out of every 100 planets). There are areas within our own galaxy and in others which are millions of years ahead and millions of years behind us, and hence there might right now be a fantastic cross‑section of human‑type or humanoid development in a variety of stages, from primitive cultures to more advanced ones. Life among the stars, according to present probability, seems to be developing in billions upon billions of places, with perhaps a million places in our own galaxy. Cosmology cannot be considered apart from the phenomenology of subject‑objectivity and the process of awareness, and consequently any attempt to merely picture the evolution of the various levels of matter in motion as a blind phenomenon of meaningless matter (or a tautological evolution of a pure universal mind) is to become alienated by the linearized abstractions of science that picture cosmological evolution in merely mechanical or formal terms. The status of cosmology today is but a scientific equivalent to the mythological structures primitive consciousness accumulated — clearer, more precise, but at the same time lacking the depth and profundity many of these more primitive but immediate and direct formulations of consciousness possessed. Regarded dialectically, cosmology studies the cybernetic totality of all levels of nonlinear interaction, postulating no objectified or particular beginning, or any objectified end. Dialectics refuses to postulate either the existence of an “ultimate particle” or an “ultimate and final state” of consciousness or matter (all such states involving an assumed finiteness and/or boundedness of the universe). Rather, all mediations and objectifications are seen to be either in a direct state of immediate subjectivity and nonlinearity (in which case no question arises as to beginnings and ends) or in a self‑mediated state of immediacy (in which case any given level of mediation and linearization by dialectical necessity must refer to a deeper state of nonlinear internal interaction within each of the linear objects interacting). The question of beginning and end is essentially self‑negative. Either experience is directly immediate without any boundaries, or there are boundaries, in which case any object or linearized beginning and end must reveal a deeper state of interaction between and within the object and its space or context. This is just a way of saying that a particular boundary cannot be an ultimate one. Thus, “ultimate presence” can never be a particularized object‑complex (such as a photon or an atom “itself”), but must be a paradoxical nonlinear state of immediacy, which always has the potentiality and essence (being immediate and not bounded) of revealing or developing sub‑linearizations or meta‑linearizations. This, of course, is but a way of denying the objecti­fication of any absolute as an existent. The question as to whether the universe is “finite or infinite” in space or time is thus transcended in a dialectical cosmology, for both conceptions as isolated identifications are delimitations and objectified possibilities. As separated alternatives, moreover, they are contradictory opposites and not paradoxical and dialectical. The Hegelian notion of “true infinity,” however, is a paradoxical synthesis and transcendence of both a finite cosmology predi­cated only upon a given and static universe, and a merely infinite cosmology predicated simply upon a universe that is ever incomplete and beyond what ever is given. A dialectically infinite cosmology based upon a “true infinity” regards the objective universe as a state in which being itself is never in any given, or identified state that can remain fixed, or become unfixed and change. All being is ever becoming‑given and consequently a dialectical infinity neither converges to a given, nor diverges beyond a given, but continually “transverges” with what is into a new form of itself: nothing is given! A dialectical cosmology perceives‑conceives nature as a dynamic immediacy in which all mediation is immediately self‑mediation, all movement is self‑movement and “growth” (positive or negative growth, generation or degeneration) and never a mere external movement or becoming leading to a mere infinity beyond any given. It is not a question of any ultimate conservation of energy or of any closed universe leading to thermodynamic stagnation on the one hand or of an open universe beyond conservation, determination and understanding on the other. The notions of complete vs. incomplete, closed vs. open, symmetrical vs. asymmetrical, finite vs. infinite, determinate vs. indeterminate, absolute vs. relative are all abstract linearizations and consequently inapplicable as a description for a dialectical cosmology. Rather, such notions are always both applicable in the presentation of any one aspect, depending upon the perspective chosen, and at the same time inapplicable in their linearized oppositional forms. A dialectics of nature ends with cosmology or the “reality of existence” as being beyond any product or “final conclusion” of abstraction, including the equally abstract notion that such an impossibility is a lack and a negative result. Nature being the very process that is happening, cannot in reality be regarded as an external frame of reference or “world” within which man moves in a container of space and time. Nature, along with space and time, is rather the very process of interaction defining the state of subjectivity and intersubjectivity man is experiencing. What have you actually experienced of that which you take to be the vast empty spaces filled here and there with stars, lumps of rock and dust, and implacable energy transformations as elusive as they are inevitable? How much of your conception of nature and science is the result of taking the models and myths of linearized products, produced by science as the pointers to reality as the reality itself, instead of experiencing yourself either as a human being in nature, or as a scientist in the act of scientific praxis? From a scientific viewpoint, theoretical structures serve as a frame of reference with which to regard empirical observation; as a result, both observations and theoretical structures co‑evolve in mutual feedback. Within any particular area of science, empirical observation is generally limited to the so‑called objective component, be it facts, numbers or persons which appear as the objects in question. If a certain set of “facts” appear which do not “fit in” to a given structure, or which one wants to utilize to predict other “facts” or objectifications not yet visible, then theoretical structures in the form of “hypotheses” appear. However, it is the history of consciousness that determines the relevancy or significance of a particular hypothesis for a given state of objective interaction (with regard to its very practical side of directing human consciousness and not simply “informing” it). It is also possible to consider these hypotheses or theories “about” facts as facts themselves; that is, as objectifications appearing in the history of consciousness in its attempts to become self‑conscious of its own conditioning. Thus, the dialectics of nature is a theory of subject‑object phenomenology, and is part of the overall “encyclopedia of the sciences” given here as a unified field theory of logic, nature, and humanity. This means that it is in effect a “metascience” and not a direct science or a nonscientific philosophy about science. Thus, the encyclopedia here developed, and the dialectics of nature within it, is a science which makes theories about the various sciences in their praxis of making theories: dialectical science regards as its “factual basis” the history and development of science as part of the development of social consciousness. The encyclopedia of the sciences as here presented regards all sciences in terms of nine major divisions — divisions and linearizations which explicitly refer to the nonlinear totality within which they function as a singular science of man in nature. Consequently, each of the various nine sciences (and the innumerable sub‑sciences definable) must in some way or other reflect within their own particular theoretics non‑linear relations of mutual co‑determination with all the other sciences as outlined here. The sciences of syntactics, semantics, pragmatics; physics, natural science, cosmology; psychology, social dynamics and concrete philosophy form a singular nonlinear totality. The various particular theories formulated within each of these sciences must give explicit expression to this nonlinearity if the unified encyclopedia of the sciences and the dialectics of nature within it does in fact express a meaningful and significant theory about the nature of consciousness and its evolution from the objective world. Consequently, the dialectics of the sciences can now offer a concrete program of action. It can offer a criterion of judgment about what it takes to be its “factual” basis: namely, the various particular theories emerging within the specialized sciences. If a particular science such as physics produces several hypotheses and theories, each of which is more or less satisfactory regarding the way in which it relates known empirical data, one can then regard these several theories themselves as facts to be analyzed by the dialectics of nature as a meta‑science. Thus, according to the nonlinear perspective, or the meta‑science of dialectics, one can then regard the various theories under consideration in terms of the relevancy these theories have as an explicit expression of nonlinearity, and represent the better of the known theories in a form that best brings out the nonlinear components involved. The dialectics of nature then regards the theory most developed in its nonlinear formulation of the facts as the theory most likely to be relevant, i.e., most likely to give the best account of both present facts and future facts not yet uncovered. As with any hypothesis in a particular science, it is the history of consciousness that determines whether or not the meta‑theory of dialectic is correct in its judgment. Furthermore, a feedback structure between the dialectic in any one nonlinear form, and the actual evolution of relevant theories in the particular sciences takes place, continually transforming the meta‑science of dialectic itself through the history of its factual basis: the history of the particular theories in the sciences. Thus, the dialectics of nature becomes more ‘’efficient” in interpreting the linear and nonlinear components of nonlinearity. Nonlinearity, like immediacy and subjectivity, is a field of presence within which linearizations, mediations and objecti­fications appear: nonlinearity works through linearizations and hence is not a simple (linear!) negation of linearity. Relativity and quantum mechanics are incorrectly presented as general theories of matter in motion; in fact, they are dependent in their present form upon constants of a particular level. If one is aware of the dialectical nature of levels of material interaction, one does not present a c‑dependent relativity as a general theory of space and time. Instead, one explicitly shows how relativity is a function of electro‑magnetic space and time. The presentation of relativity to date mystifies physics by reducing the dynamic variables of a specific kind of material interaction (which is always a function of a particular level) into a generalized abstract kinematics and geometry. Relativity makes the specificity of light‑dynamics into a general dynamics, and consequently makes light‑dynamics itself unexplainable while forcing the specificity of other non‑light modalities into a light‑frame of reference. Relativistic space‑time geometry, a product of a specific kind of experience, is set up as a nonmaterial condition independent of the actual properties of photon‑charge interaction. Any kind of matter— even matter having nothing directly to do with photon‑charge dynamics — is nevertheless governed by that interaction process. Here we have an important example of how a model of interaction derived as a specific product from experience now inverts the order. The space‑time model for a particular activity is taken as reality and used as a means for judging all of experience and possible experience relative to it. For all its aesthetics, rela­tivity has alienated physical experience. Instead of either grasping the universal syntactics of c‑dependent relativity which goes beyond any semantical localization to a specific constant called c or seeing how the electronic level actually accounts for relativistic energy transformations in a concrete way (making mass, momentum and energy changes always changes in electro‑magnetic energy which is charge‑photon dependent), relativity obscures the issue by replacing physical experience and intuition with the “beauty” of a purely mathematical model of physical interaction. Modern physics is so used to developing its theoretics in abstract formalistic terms by stating that “physical intuition” cannot “reach” beyond a certain point (meaning that intuition, like any faculty, must be trained and sharpened in order not to become lazy), that it has become a kind of formidable idealism, stifling any kind of approach which wants to reintroduce physical models (not just mathematical ones) back into the theories of physics. A division of labor exists between the experimentalists who measure existence and the theoreticians. The theoreticians, the prima donnas of physics, bring into play gigantic patterns of formal mathematical manipulation, constructing schemas of relation which have no direct bearing upon the physical meaning of the models constructed — although with some effort, any symbolic relation can be given both a physical and a psychological meaning. For example, the electro‑magnetic field is so vaguely defined that most students of physics take a long time before they realize that the formal definitions of electric and magnetic field densities and intensities actually refer to a material process of photon interaction through space. Relativity, abstractly developed, in turn has caused quantum mechanics to appear as an even more abstract formalism of interaction. By not seeing (indirectly through DeBroglie or directly through J.J. Thompson) how quantum mechanics follows naturally from an electro‑magnetic relativity, standard quantum mechanics is presented in terms of a mysterious “Psi”‑wave function. This function is a “probability wave” which is taken to be a generalized and abstract mathematical relation in space and time. In reality, the Psi-wave function is a concrete manifestation of the electro­magnetic field in resonance with its own source charges, producing a nonlinear dispersive equation for electro‑magnetic wave‑length and frequency which — upon analysis — gives rise to the standard forms of quantum wave mechanics. Not only is it possible to derive relativity and quantum mechanics from electro‑magnetism, but the physical model used is a direct expression of the dialectics of the electronic level of matter in motion. The fundamental model postulates a structure consisting of a “charge-field coupling” state in which the electro‑magnetic field as wave‑radiation is coupled with a charge or particle localization of the field, producing a particle‑wave or charge‑field self‑interaction structure purely in terms of electro‑magnetic variables. The model itself progresses in a dialectic of three stages. In stage one, any charge initially appears as a simple particle with “attached” induction fields. These induction fields act as the direct extension of the charges into space and have no autonomy from the charges. Here, the classical electric and magnetic force equations between charges and their induction fields can be defined. Stage two analyzes the properties of these electric and magnetic induction fields, and discovers that their interrelation in “free space” causes them to be continually re‑induced as a wave‑phenomena traveling at the speed of light c. (We now enter the stage of Maxwell’s equations and relativity.) These so‑called induction fields, previously thought to be mere extensions of the charges into space, can actually exist in space as free wave‑radiation, i.e., as an autonomous radiation field possessing momentum and energy. Furthermore, a calcula­tion of the energy and momentum changes undergone by light absorption and emission by charges leads directly to the relativistic expressions for energy and momentum without introducing a space‑time transformation geometry. However, the space‑time kinematics of the electro‑magnetic field, when looked at from the invariance of Maxwell’s equations, do give rise to relativistic space‑time transformations of electro‑magnetic space based upon the constancy of the “medium” parameters, which in turn means the constancy of the velocity of light c. This invariance, however, from our perspective merely means that the speed of any specific quantity of energy of the electro‑magnetic radiation field must always have a constant value relative to the induction field attached to a sending or receiving charged particle. From this, one can calculate wave‑length and frequency changes or transformations. One can interpret these as length and time changes but not necessarily as generalized changes in “space and time” as if they were self‑sustaining “things” or “relations” instead of expressing interaction properties of events and event‑complexes called objects. We now have a contradiction between stage one and stage two. In stage one, the field appears as an actual dependent extension of the charged particle into space (an induction field), while in stage two, the field also appears as an autonomous wave‑field independent of the particle (a radiation field). The only way out of this contradiction is to realize that a charge and its radiating field, or particle and wave, must be redefined in terms of each other as two sides of a singular paradoxical phenomenon. Thus, a charged particle sets up a field which is at once both dependent and independent of the charge. The field exists in an interdependent state of mutual coupling with the charge in a state of inseparable distinction. Thus, in stage three, particle and field once more appear “connected,” but not in the simple fashion initially found in stage one. Now, by dialectical necessity, the distinctness between the field and the particle, discovered in stage two as an existential condition of field objectification (autonomy) in conjunction with their inseparability as a singular state or “essence” as formulated in stage one, makes each in reality an explicit function of the other. Consequently, the charged particle appears redefined in terms of the autonomous wave‑field it sets up, and becomes a “group” wave‑effect. On the other hand, the wave‑field set up by such a particle, in turn is a function of the particle‑localization of the wave into a self‑contained topology. Thus, any wave radiation coming from such a quantized and localized wave state will display itself in the form of quantized “photons” of radiation. By using Maxwell’s equations for wave‑radiation in free space, and investigating the way in which such a wave‑radiation interacts with the source‑particle setting up this wave‑radiation, the source particle in turn being but a localizaton effect of these waves, will give rise to a dispersive wave equation w2‑c2k =w0 2. When this is combined with a similar parallel equation for energy and momentum obtained from analyzing the way in which electro‑magnetic energy and momentum changes, E2‑c2p2= E02, one can obtain the two fundamental DeBroglie relations of quantum mechanics, E = Hw and p = Hk, where Planck’s constant is obtained as a constant ratio between rest‑frequency and rest mass, H = (m0/w0)c2, which has to be the same constant for all charge systems capable of being mutually coupled together by means of common electro‑magnetic field interaction. Quantum mechanical relations as presently formulated (in either the standard way, or the approach used here), are applicable only to those systems whose energy is electro‑magnetic field energy (energy in the form of E = mc2). These relations also express the way in which this energy behaves when it is in a state of interaction between itself as localized particle energy and itself as nonlocalized field energy. We have now set up a particular model or theory of electro‑magnetic dynamics according to a dialectical structure of nonlinear self‑interaction. This theory expresses the relation between a charge and its field as also a relation within or relative to each, and as a result obtains a reformulation of relativity and quantum mechanics. Such a formulation has definite physical consequences which can be subjected to experimental verification or invalidation. For example, the electro‑magnetic model for relativity and quantum mechanics makes certain claims as to the structure and topology of charges, and to a certain relation between three important constants: the electron charge e, the velocity of light c, and Planck’s constant h (or H), and their interrelation into the fine‑structure contant — which must be worked out in greater detail and then submitted as a theory capable of being tested. Summarizing the essential physics of this model, one can say that pure particle mechanics (with static field conditions) would be Newtonian classical physics; pure electro‑magnetic field‑wave mechanics (with particle boundary conditions) would be relativistic classical physics, and both are examples of linear dynamics. It is only when quantum mechanics is explicitly developed as a field‑particle self‑interaction process that a genuine nonlinear nonclassical physics arises in which pure Newtonian particle physics and relativistic wave propagation at the speed of light become special sub‑cases. Then, and only then, is quantum mechanics not simply another theory imposed axiomatically upon particle and field relations, but rather the very expression of the mutual dialectic between particle and field capable of being idealized as a universal syntactics, always open to reevaluation. Thus, the dialectics of nature is a theory and philosophy of consciousness, based upon an explicit phenomenology of subject‑objectivity. However, the dialectics of nature is also a praxis and history of consciousness. It is a meta-science praxis which can be utilized concretely as a working model for the analysis of theoretical structures as they appear in the particular sciences — a model which can be subjected to the history of consciousness and through that history continually become redefined and reformulated. If this is done, the history of consciousness will itself become a more explicit function of the dialectical philosophy that is emerging from it, as a result of the concrete dialectical praxis set into motion. Thus, philosophy becomes historical and history in turn philosophical. A revolution in the sciences is necessary before this can happen, which in turn means that the culture of man and the entire social dynamics must become radicalized. The purpose of this paper has been to show what such a revolution means for the sciences within that culture. Hopefully, it can also be a small part of that revolution. See Michael Kosok, “The Dynamics of Paradox” and “The Dialiectical Matrix,” in Telos No. 5 (Spring, 1970). If X is a function of Y, and Y is a function of X, then X is a function of itself through Y. Indeed, one can mention that a genuine dialectics of logic has to move beyond the simple presentation of “assertions” in the form of statements or sentences. The role of a genuine subjectivity must be developed in which the logical status of questions must be given a place. A question cannot be written in a simple assertive manner as a sequence of forms without transforming that question into a statement or assertion. Thus, the dialectic between observing patterns and observed patterns involves a dialogical logic between questioning patterns and responding patterns to form a genuine dialogue that expresses terms or objects in their state of being-formed (reformed, unformed, transformed). The activity of questioning is the activity of de-localization — the activity of subjectivity which is a field of presence, but not itself a term, element or object‑present. This, of course, implies that without any terms, objects, or events present, the question and subject would be empty, just as the statements or events present without question and a field would be blind and irrational: non relational, non‑effective and consequently, nonexistent. This section represents the development of ideas for a dialectics of nature initially started several decades ago by my father, the late Dr. Paul Kosok. In fact, it was his unique perspective of nature which prompted my work in dialectics to begin with, and I set as one of my major goals the validation of this view by trying to make it into an integral phenomenon of the dialectic process itself. There are, naturally, other fields on a sub‑atomic level, such as the strong and weak fields associated with nuclear structures and decay products, but they will not concern us directly here for they are associated with the structure of elementary sub‑atomic particles in various states; structures whose constitution is still quite ambiguous and which may lead to sub‑electronic and sub‑charged dimensions or levels of interaction not yet known. The gravitation field is most remote in so far as its inner dynamics is concerned. It may be that, unlike particular fields associated with particular localizations, the gravitational field is a general‑total-effect of all fields and localizations acting together or in some combined way — in that the field seems to depend not upon the type of matter or distinction present, but only upon the mere presence of matter or distinctions themselves. In this case, gravity would be part of both “pure physics,”which deals with the universal nature of space, time and matter, and with cosmology, which deals with the overall totality of levels. In order to proceed with such a program, an “institute of dialectic research” (or an “institute of nonlinear research”) is naturally necessary. for no one individual can integrate the various sciences together as proposed by the encyclopedia. Such an integration requires a major reorientation of all the fixated categories presently employed by the various sciences. The author, being familiar with some of the problems within one of the sciences, namely physics, has proposed a particular model of electro‑magnetic interaction — based upon a dialectic analysis of the variables present — in which relativity and quantum mechanics appear directly out of the nature of charge‑field interaction, see the Science News Letter (Spring, 1970), published by Fairleigh Dickinson University at Teaneck, New Jersey.